I’m going to say right off the bat that I don’t know much about how real life custody battles work. But that’s okay because I’m not sure Grey’s Anatomy does either. What we see unfold tonight is more like an oddly detailed interrogation of the inner workings of Grey Sloan Memorial hospital than it is an exploration of what’s best for Sofia Robbin Sloan Torres. But verisimilitude is the least of “Mama Tried”’s problems. The episode’s biggest flaw is that it’s built on a foundation of sand. And when you poke at that foundation even a little bit, the whole thing starts to crumble. Which is to say: How the hell did we get to a Calzona custody battle in the first place? The cold open tries to drive home the idea that Callie and Arizona struggled long and hard with their respective lawyers before deciding a custody battle was the only path forward. But frankly, I just don’t believe that. Callie and Arizona have been nothing but compatible co-parents since Sofia was born. Far from building on existing tension, this intense animosity comes completely out of nowhere. And as I’ve written about before, Callie’s sudden decision to move Sofia across the country for a year was so insane to begin with that it’s hard to feel invested in anything that follows. But setting aside the wonkiness of the setup, the bigger foundational flaw is that Grey’s Anatomy has never been a show about parenting. When it comes to issues of romance, friendship, and career, Grey’s has 12 seasons worth of stories to pull from. When it comes to parenting, however, we’ve got a couple delivery scenes and maybe a total of 45 minutes of footage of main characters interacting with their kids. I don’t mean that as a critique of the series. Not every show is going to touch on every aspect of life. I’m willing to suspend my disbelief and accept that Meredith, Bailey, Ben, Arizona, and Callie are great offscreen parents, much as I accept that the characters on Friends have full-time jobs despite the fact that they’re always free for coffee. But when the difficulty of parenting suddenly becomes the central theme of an episode, that suspension of disbelief comes to a screeching halt. Perhaps the show thinks it’s turning a plot hole into a compelling plot point, but it’s just drawing more attention to how unrealistically the show deals with its characters’ kids. Meredith explains that being a mother means never getting a night off, but in fact, all we’ve ever seen on this show is parents getting a night off. Their kids exist in the magic bubble of TV kids who are effortlessly taken care of via a combination of selfless family members, babysitters, and daycare. A few episodes ago, Meredith mentioned that before going into a surprise 17-hour surgery she should “call her babysitter.” I’m guessing being a working single parent is actually a little more complicated than that. In this episode, DeLuca testifies about how great it is to live with Arizona and Sofia, which is something we’ve literally never seen nor something I can even imagine happening. (I legitimately forgot DeLuca lived with Arizona and was initially confused as to why he was even at the hearing at all.) And Penny knows intricate details about Sofia’s life even though we’ve seen the two of them interact once. Good storytelling shows rather than tells its audience about important relationships. And Grey’s has shown precious little parenting over the years, which makes it difficult to invest in either the hearing or its final outcome. The climatic reveal that Arizona spends a lot of time in surgery and at trivia with Weber is undercut by the fact that Meredith casually notes “my kids are asleep” as her excuse for drinking away the night with Callie. No one ever spends extended time with their kids on this show, so why should I care about Arizona’s childcare schedule in particular? And while, sure, it’s theoretically sad that Callie won’t get to see Sofia as much, considering we hardly ever saw her with Sofia in the first place, there’s no real weight to that tragedy. Instead, the best parts of this episode forgo larger platitudes about being a parent and narrow in on Arizona’s specific relationship to parenting. Arizona’s a character I can tire of quickly, but the episode perks up a bit in its final act as it explores the humanity behind Arizona’s frequently self-righteous personality. She defends herself as an adoptive mother, arguing that she actively chose to have Sofia in her life and shouldn’t be looked down upon for not being a biological parent. It’s a great moment and a thread I would’ve liked to see the episode explore more, particularly because courts do have a tendency to side with biological mothers in custody battles. But Arizona’s best moment is when she decides to leave the courtroom to ensure her teenaged patient doesn’t lose her baby. She argues that as much as she loves Sofia, settling the custody battle isn’t a matter of life or death, while helping her patient is. More so than Meredith’s monologues about the difficulties of being a working parent, Arizona’s decision to leave the hearing drives home the reality of being both a parent and a doctor. When it’s your job to save lives, there are going to be times when work has to come first. But that doesn’t mean your child is any less loved or cared for. Arizona becomes the mother in the King Solomon story who’s willing to sacrifice her personal happiness to do the right thing. The fact that her big moment only comes because her replacement, Dr. Russo, is basically a moustache twirling villain eager to yank premature babies out of their mothers’ wombs is yet another example of how many lazy shortcuts this episode takes. “Mama Tried” isn’t a completely unenjoyable watch, and I almost feel bad coming down on it so harshly. For the most part the execution is fine: As always, the performances are great, particularly from Sara Ramirez and Jessica Capshaw. It has the narrative focus I’ve been praising this season and director Kevin McKidd (a.k.a. Owen Hunt) adds a cinematic flair to the courtroom scenes, with lots of sweeping camera shots and long takes. But, unfortunately, those stylistics tricks and a couple of good Arizona moments aren’t enough to overcome a fundamentally and deeply flawed premise. In fact, for most of the episode I was just ready for Calzona to split the kid in half and be done with it already. In contrast to the courtroom drama, April and Jackson have potentially the most mature conversation in Grey’s Anatomy history as they set the parameters for co-parenting. I’m all about this era of Japril cooperation! Jenny and her mom were last seen in “I Wear The Face.” Bringing them back is a smart way to up the stakes of the patient-of-the-week story without having to spend too much time with them. Also, just a reminder that Jenny’s mom is supposed to a 28-year-old who had Jenny when she was 14. Stephanie feels bad about breaking up with Kyle. Kyle feels bad because he has meningitis. That Mer/Callie drinking scene was really great and I’m glad Mark got name dropped a couple times this episode. 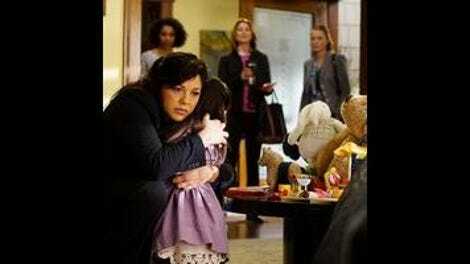 Would Callie’s girlfriend’s abilities as a parent really be called into question in a custody battle? Regardless, while it was weird that Penny knew all of Sofia’s favorite things but didn’t know what grade she was in, I’m also not sure that’s really a determination of her potential parenting skills either. I love that the judge and both lawyers were women of color and the show didn’t feel the need to make a big deal out of it. Richard was rocking that checkered suit. I was seriously tempted to give this episode an “A” just for the moment Bailey says, “Objection, speculation!” while testifying.